Happily, extremely listenable and well-balanced sound from a 24/176.4 file of Brubeck’s “Take Five,” and a 16-bit file of a track that I think was titled “Camptino,” from the Erik Truffaz Quartet featuring the wonder Rokia Traoré, was the hallmark of a large, air-walled space sponsored by multiple companies. Here, chatting was minimal, perhaps simply because the sound was so good. I really enjoyed how mellow the sax sounded, and how drums were rendered with truthfulness without becoming clattery. Part of the responsibility for the space’s success falls at the feet of the new Swiss-made Credo Cinema LTM loudspeakers ($170,000/pair). Fed and powered by a computer source and string of EMM Labs components—DV2 integrated DAC, which I most favorably reviewed for Stereophile ($30,000), DA2 Reference DAC ($25,000), TX2 CD/SACD transport ($25,000), PRE reference preamp ($25,000), and MTRX2 1000W monoblocks ($85,000/pair)—supported by Falkenohr cabinets ($20,000) that include a bottom drawer for remotes and other essential sundries, and connected by KimberKable Silver Select cabling ($80,000), this system undoubtedly won many admirers. 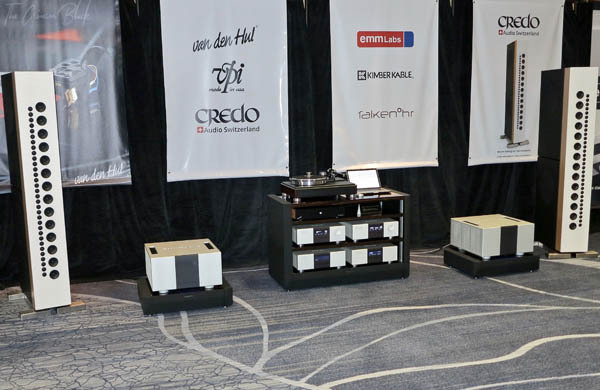 I regret that I didn’t hear the VPI HW40 limited-edition turntable ($15,000) with van den Hul Crimson Black cartridge ($7500) and Grail Special Edition Phono Preamp ($20,000).